Sing it with me… On up! You may or may not know that I wrote and produced a rap album in 2010, launched under the name curvaceous, self-titled Exponential, featuring Rasi Caprice. Today’s blog post echoes that same level and intensity of creativity and boundless thinking. One of my many subscribers sent me the following submission that I just had to share with you. It is one of the most creative and inspirational contributions I have received in quite a long time. 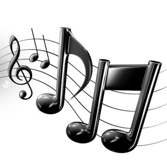 Since this was not created to a particular melody, you can say the words to music, picking your own style, rhythm and tempo. He mentioned that one of he first lessons he remembered was to just get started, that even a process like writing songs doesn’t require that you know how to play an instrument or even have a song track to work with… You can always adapt and refine the words to the chosen melody, style and format. It’s an iterative process that can get refined, massaged and adapted quite easily… Not a bad lesson to learn! I’ll go with the flo. I’ve never been no poet but in life you gotta go it to know it. So let it roll, I’ll have a go, to hold me true to it. You wanna look like you own this town. throw a curve ball straight round the probability stack. Increase the frequency till it’s a matter of fact. shoot by numbers for a hail pass, a mate’s pass, even a bus pass. Just get on the next gig you already know how to razz. Anything to not end up at the under pass. Gotta go whilst there’s some petrol in the tank. But I’ll be back, to stoke the Exp-On-Up-tial memory bank. That’s Exp-One-tial, high frequency with Marc to thank. wants to make their own. If you ain’t On Up! You gotta Ka-ching, Ka-change. There ain’t no honor in a flop. There ain’t no give if you ain’t got. if you don’t provide someone else their value. Gotta be wise, to see past traps and all those damn lies. Don’t rely on a one off shot at the sky. When you’ve got none, you got to try-try-try-angulate for a slice of the pie. Before you can multipli, you gotta create meaning beyond I. In Oz we got a game called 2-up. But if you got no coins it’s none up. Don’t get down. So what’s up? You gonna be the one up to play On-Up?!? they’re out there waiting for you schmucks. Ohh no one told you the deck was stacked. Guess what? You gonna get smacked. Straight cut to go-to-jail cards. In the real monopoly world there ain’t no get-out-of-jail-free cards. Forget your escape. There ain’t nowhere to hide. So it’s life, get over yourself, get on, let’s ride. Don’t share the pain, people don’t want to hear it, even if it goes deep. You gotta create, share the love and earn your keep. You better learn to be quick on your feet. What you learn it better work on the street. It be easy, it better add value and feel like a treat. Word on the street is Dr Marc Dussault is the man to meet. If, if, if, if, if, if you want to do it neat. So do ya wanna get On Up!?!?! Published on September 16, 2013 in Creativity, Fun Stuff, Motivation, Positive Thinking and Strategy. 0 Comments Tags: Flaws, Intent, Intentions. 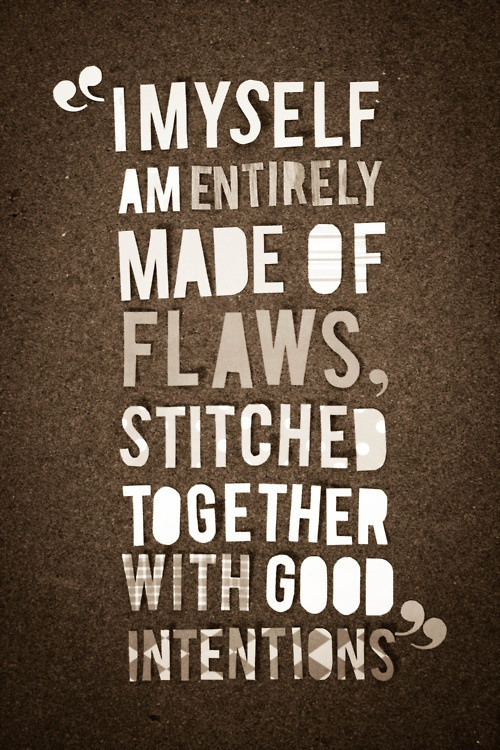 I myself am entirely made of flaws stitched together with good intentions. I had not heard this quote before and I thought the visual was interesting. I wanted to share it with you to give you something to reflect on. Without wanting to sound judgmental or accusatory, what good intentions are you not acting on that you think or know you should take action on? What flaws do you think you need to reduce or eliminate? Something we can all benefit from – not trying to be perfect, just better versions of ourselves.